BabyGo Baby Carrier Kangaroo Carrier Economical Cheap . This baby carrier is Made in India. Presents hooded Carry Nest in superior cotton fabric, available in beautiful colours and prints. Perfect for wrapping newborn babies when an extra layer is required. Soft cotton inner lining for extra comfort to the newborn baby. Suitable for all weathers both at home and while travelling. We are actively engaged in providing best and excellent quality array of Baby Carriers. 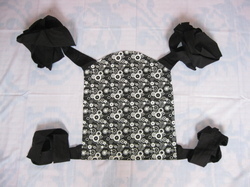 We are offering Baby Carriers.These carriers have two way quality that helps in facing the baby in both directions. Furthermore, these have comfortable and padded straps that can be easily adjusted for perfect fit. Our carriers are appreciated for their fashionable style, durability, light weight and attractive colors. Banking on years of understanding of this domain, we render the first class quality of Baby Carrier. Their rugged construction and elegant design, makes these products highly demanded. We supply a wide array of products to the valued clients, with the high-quality Baby Carrier.